We're gonna need a bigger fence! A mountain lion in Santa Cruz found itself wanting to be on the other side of a 6-foot high fence. The only problem was figuring out a way to get there. After trying for a few minutes to scope an alternate route, it opts for the quick way over. And it's a pretty impressive feat! This footage was shot on private property near Pasatiempo. Everyone already knows how mountain lions are known for their speed and agility. This video is just a further demonstration of that. The Olympic high jumpers are probably jealous of this big cat's leaping ability from a still position! 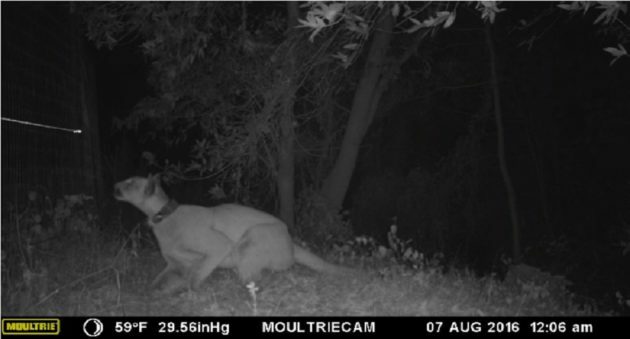 As if you needed another reason to be wary of mountain lions when out exploring the great outdoors right? Time to add an extra two feet to the fence!